Let’s be clear, we all scream for Van Leeuwen. 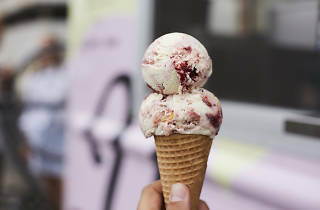 We recently announced that in celebration of the brand’s 10th anniversary, the popular ice cream scoop shop is in the process of opening five new locations by the end of the summer: Nolita (already open), Upper West Side (next to open), SoHo, Upper East Side, and Prospect Heights. Each will have its own location-specific flavor inspired by the surrounding neighborhood, like Nolita’s Classic Cannoli or Upper West Sides’ Black and White Cookie. However, the good news keeps coming, because we just learned that this summer, Van Leeuwen will be debuting soft serve ice cream exclusively at their Williamsburg shop (204 Wythe Ave). Only available throughout the summer, you can be sure to expect an exciting roster of flavors, both classic and modern, just like their current varieties. With two offerings at a time, (which you can twist together if you’re feeling wild), some example flavor duos you can prepare yourselves for include turmeric-ginger and spiced vanilla caramel, as well as caramel and chocolate. Hopefully, they’ll work their witchcraft and add in some vegan soft serve at some point—they’ve become known for making some of the richest dairy-free ice cream in the game. 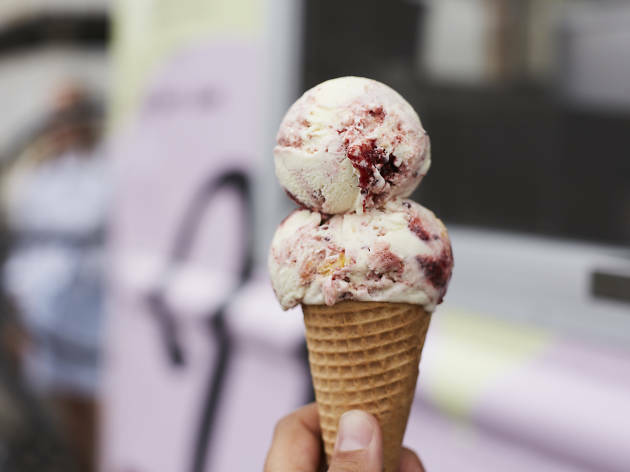 Beginning this week, you’ll be able to get a get a cup or cone for $5 at the Williamsburg shop. We are warning you now that this will only last for the summer, so if you’re on a kick to find the best soft serve to fight off the heat, you should put this at the top of your ice cream bucket list.